But it's not just because of his infectious enthusiasm and engaging smile. It's also because he's only 11 years old. Some of his advice may sound hackneyed: "every second is a challenge," he says in one video. "Failure is the basis of success." But his audiences don't seem to mind. Bilal Khan, a political science student twice Safi's age who came to listen to his speech, said the boy wonder had had a profound effect on him. "A few months ago I was really disappointed with life... I was (thinking) about suicide, because there are no jobs and no success in life," he told AFP. "Then I saw a movie of Hammad Safi. I thought, if an 11-year-old child can do anything, why can't I?" "People love him because he's just talking, he's a hit every time," says Samiullah Waqil, one of his former English teachers. Safi's youth and precociousness seem to form part of the enchantment. Discussing Allama Iqbal, a renowned poet widely regarded as having inspired the movement to create Pakistan, Safi says: "If he had not been there, I or anyone else would surely be cleaning the toilet in the house of an Englishman." At USECS, the faculty see him as a "nanha professor", or little teacher; a protege who could go on to great things one day - though what, exactly, they are looking for from him remains undefined. Safi was studying at a traditional school but also taking English classes at USECS, where he was quickly noticed for his "phenomenal self-confidence", says director Ammer Sohail. His "job", says Sohail, is to encourage the poorer students, "to give them hope, so that they break their glass ceiling" in a country with glaring education inequality, where more than 40 percent of the population is illiterate, according to UN data. "We want it to spread this education awareness to the whole country," he says emphatically. Safi's father, a wealthy 48-year-old businessman from Peshawar named Abdul Rehman Khan, agrees. "He is not on ordinary child," he explains. "People have seen something in him. I have myself seen abilities in him. That's why I have appointed special teachers for him. I want him to become a special leader. "I'm very proud... For his abilities, for his intelligence, he is God-gifted." 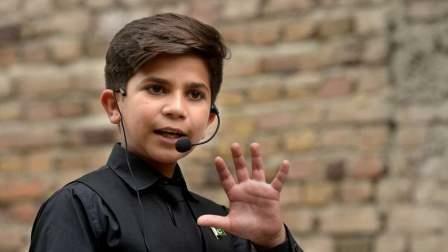 "I am an inspiration, not only for Pakistan, but for the world. I inspire the entire universe," he tells AFP, without blinking. He sometimes studies "10 to 12 hours in a row," according to his professors. "Posters of cartoon heroes or sportsmen are absent, toys are few. "Batman and Superman are fake heroes, but those are true," he says, pointing to the portraits of Allama Iqbal, Bill Gates and Albert Einstein adorning his walls. "Where's the child in him? He's gone, because he thinks above his age," worries Bakht Zaman, a professor at Peshawar University, who attended a lecture later shared widely on YouTube. "This talented child is a good motivational coach" but "he lacks intellectual depth," he notes. "He can become what they want to do with him, but it will take time." Hassan Amir Shah, the vice chancellor of the public university of Lahore, where Safi has also lectured, hopes for his part that all the attention "will not drive him crazy". "He still has a long way to go, many books to read," he tells AFP. "We will only be able to judge him in 20 years, when he is an adult."